The Caps reclaim the top spot. Phoenix and Vancouver are up, as San Jose and Ottawa tank. Ovechkin was suspended for his shove of Chicago's Campbell. Honestly, the Caps don't need him to shove opponents around. Even when they lose, they nearly always seem to manage to secure a point. Winners of seven straight. Who would have believed that this team would contend for the top spot in the West? Bryzgalov is red hot. Take a look at the talent waiting in their system and you realize that Phoenix is poised to become a power for years to come! Vancouver has won seven of ten since the break. Nearly all of their top players are clicking and at just the right time. Chicago and San Jose were thought to have the West locked up, but Phoenix and Vancouver have other ideas. If it weren't for the Kings, the Hawks would be on a four game skid. Luckily for them, L.A. has given them two wins. Additionally, the Sharks have faltered, handing Chicago a share of the conference lead. If it weren't for the fact that the Penguins were owned by New Jersey, they might be challenging the Caps for the conference crown. But, alas, they will have to fight it out to the very end with those same Devils for the number two slot in the East. The Devils cannot lose to Pittsburgh, and we were tempted to move them ahead of Pittsburgh; but they struggle with the rest of the division and cannot beat bottom feeders. New Jersey has recent trip ups against the Isles, Oilers and Leafs! What happened? The Sharks have lost four in a row and lost badly! Their top scorers have been next to invisible and Nabokov...yeeesh! The Preds have won four straight, which include a pair of shutouts by outstanding netminder Pekka Rinne. Nashville's playoff spot is all but wrapped up and the team has a chance to move up to as high as the fifth seed in the West. The Avs had put together their first win streak since the break before losing to Calgary Wednesday night. Recent acquisition Peter Mueller has been a smashing success in the Mile High City, but the team has not been able to keep pace with the rival Canucks for the division lead. This just in: Ryan Miller is human! He even gave up three goals... in less than one period in Atlanta! The Sabres have faltered a bit, but Ottawa has been awful. Barring a collapse in the last dozen or so games, Buffalo will be assured of a top three seed in the East. The Kings have won only three times since the break and have lost ground in the West. They do not appear to be in any real danger of losing their playoff spot, but their offense needs to kick back into gear again soon. Well, what do you know? the Wings are healthy and they are winning games! They have few real tests the rest of the way and they will be playing in the post-season. The Flyers may want to consider playing the remaindure of their schedule with an empty net. They cannot keep any of their goalies healthy. The latest victim: Michael Leighton, who will miss 8-10 weeks with a high ankle sprain. The balance of their season rests in the hands of Brian "don't call me Bobby" Boucher, whom we are sure, l-l-l-loves his m-m-m-mamma too! Winners of six straight and seven of eight since the break, Montreal is finding a way to win. Apparently, all they had to do was change GMs and injure their best goal scorer! Why didn't they think of that earlier? The Canes continue to be one of the better teams in the NHL since mid January. They have recently notched wins against conference leaders Pittsburgh and Washington and have kept their march going despite the loss of Cam Ward and the trading of many of their impending UFAs. A pair of loses to start the week has knocked Calgary back out of their playoff spot in the West. The teams ahead of them are at the top of their game. The Flames will have to get as hot at the "C" on their sweaters to make the post-season. With only one victory since the break, the Senators are in a free fall. Not so long ago they posted one of the longer win streaks in the league this season. Yet, now they are mired in an ugly slump, as they have struggled mightily to score goals and have been pathetically poor defensively as well. Another team that has found it's stroke just a little late. They are playing extremely well, but it will take another miracle run to get themselves into the playoffs. The Wild signed the most coveted U.S. College free agent Casey Wellman this week. that was the good news. The bad news: Minnesota was manhandled by Nashville in their next game and they have no hope of making the playoffs in the West. The Bruins got a chance to punch Matt Cooke on Thursday, but ended up losing for the fifth time in their last seven games. Nevertheless Boston is still in the race in the East with their closest competitors for the eighth spot, the Rangers and Thrashers on the schedule next. The Ducks beat the West's co-leaders San Jose and Chicago in consecutive games, but lost one of their best defenders, James Wisniewski to an eight game suspension for his extremely dumb retaliation hit on Chicago's Brent Seabrook. The skid is over as Atlanta has won their last two. 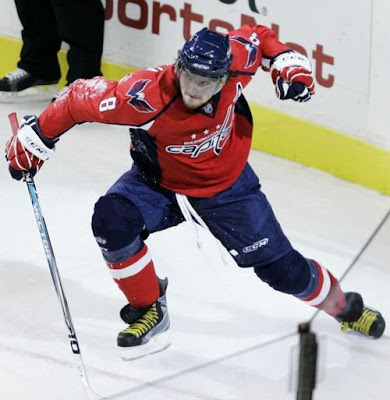 They are still in the hunt for the eighth seed, and we are betting that the division rival Capitals are hoping they pull it off. Washington has yet to lose this season to Atlanta. Wrapped around impressive wins against Washington and San Jose are seven loses in the month of March. The Stars have played very poorly defensively and have to be looking to "next year" already. Much like Dallas, the Rangers have few wins to speak of in March. They have found ways to lose, getting blown out, shut out, or going down in OT since the break. The Isles have halted their skid and begun their own winning streak with dominant performances over the Devils, Leafs and Canucks. The later included a five point night by super rookie John Tavares. The Leafs may actually be finding their game. With wins in five of their last six, do Toronto fans dare to dream of what may happen next season? The Jackets continue to be consistently inconsistent. Their struggles have clouded the vision of the future for this franchise. Is this season a fluke or was last years' success the fluke? Horton is back for Florida, but what will it matter? You never know what you are going to get out of this group. Will they score seven like they did against Philly, or give up seven like they did against an Ovechkin-less Capitals team? Tampa lost Ryan Malone for the next two weeks. But, with only two wins since the break, the Lightning are just auditioning for next year's club. Oh... and Steve Downie is still a cheap shot artist. He needs to borrow $1,000 from someone. Any takers? A road game for Edmonton means a loss. The equipment guy needs to start carrying a "Welcome to Rexall Place" sign with them to place in the visitor dressing room. Fool them into winning one every once in a while.